The spinal column is made up of individual bones known as vertebrae that are linked together one on top of the other, creating the spine. The spaces between these individual vertebrae are cushioned with pads of cartilage known as intervertebral discs. These soft and compressible discs not only act as shock absorbers, but they contribute to the overall flexibility of the spine. The discs themselves have a strong and fibrous outside layer that holds in the nucleus pulposus, which is the soft, jelly-like tissue on the inside. In patients with a prolapsed disc, which can also be referred to as herniated, ruptured, or slipped disc, the nucleus pulposus herniates through a weak area in the outer later of the disc. This bulge then puts pressure onto the other structures that make up the spinal column. 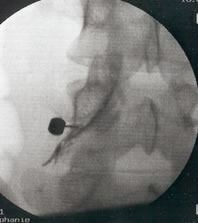 Pain with this condition is believed to be primarily the result of compression from the bulging disc on a nearby nerve. 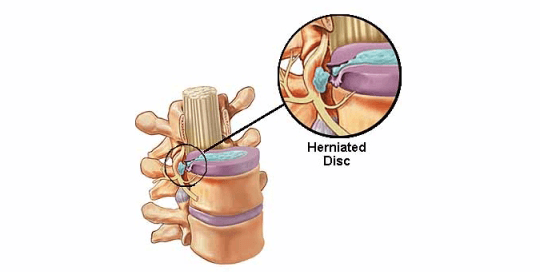 Inflammation that occurs around the herniated disc may also contribute to the patient’s pain. A prolapsed disc can occur anywhere throughout the spine, though most prolapsed discs occur in the lumbar area. The size of the bulge can also vary widely and, in general, patients who have experienced relatively large bulges in the disc are expected to experience more severe pain. The specific symptoms of pain associated with prolapsed disc can vary widely. Some patients will experience the pain as a highly specific sharp stab, while others report that the pain is more general and widespread. Generally, symptoms of pain come on suddenly and are severe. In some cases, the severity of the pain is reduced when the patient is lying down. Additional symptoms associated with a prolapsed disc include numbness and painful tingling sensations. The pain can also be felt as nerve root pain that travels along the spinal column. Thus, patients will complain of pain that radiates to other areas. For instance, patients may experience pain that travels down the leg to the calf or the foot. Though the literature remains somewhat unclear, it is believed that some individuals have the propensity to develop a prolapsed disc owing to congenital weaknesses in the fibrous layer of the intervertebral discs. Additionally, some believe that these weaknesses are the result of normal changes within the intervertebral discs over time. Indeed, normal wear and tear on the body is not sufficient to account for the pain typically associated with this condition, and some scientists disagree about the actual cause. Factors other than normal aging have been identified as playing a role in prolapsing intervertebral discs. They include bending awkwardly, frequent heavy lifting, a sedentary lifestyle, smoking, being overweight, playing weight-bearing sports, or a traumatic back injury. While there are many treatments available to help provide relief to patients experiencing pain associated with a prolapsed disc, it is recommended that patients who are not experiencing severe, debilitating pain attempt conservative, at-home treatments first. Indeed, patients with a prolapsed disc that occurred as a result of an injury should not put too much strain on the muscles in their back or joints for the first several days. Once the patient feels ready, physical therapy, including targeted exercises and routine stretches have been shown to be beneficial to prolapsed disc patients. Swimming is also recommended to patients with a prolapsed disc, as it is low impact and puts very little strain on the joints. Over-the-counter pain relievers may also be beneficial in providing relief from pain. A non-steroidal anti-inflammatory drug (NSAID) may help patients who are experiencing moderate pain. These medications are recommended because of their ability to reduce inflammation of the affected intervertebral disc, thereby reducing the associated pain. Oral corticosteroids, such as prednisone and cortisone, may also be recommended to reduce pain and inflammation of the affected area. Individuals whose pain does not respond to over-the-counter remedies may wish to speak to their doctor about prescribing codeine to help manage their pain. Codeine is an opioid medication whose pain-relieving effects arise by binding to the opioid receptors within the brain. Studies have provided ample support for the use of opioids in short-term relief of sudden-onset, severe pain; however, concerns related to the misuse and abuse of this medication suggest that long-term use of opioids for managing pain is not advisable. Patients with chronic or severe pain may wish to try more aggressive forms of pain management. For instance, epidural steroid injections have been shown to be successful in providing patients with a prolapsed disc, significant reductions in pain. TENS units, which are devices that deliver a very mild electrical stimulation to the affected area, have also received some support for individuals with prolapsed disc. Additionally, there is some indication that patients can experience a significant reduction in pain with spinal cord stimulation. This procedure involves implanting a device near the spinal column that delivers electrical impulses to control the transmission of pain signals from the nerves within the spine. In the way of alternative techniques, biofeedback training has received support for helping patients manage their symptoms of pain associated with a prolapsed disc. This treatment involves teaching patients how to use relaxation and coping skills to gain some control over their own symptoms of pain. Complementary therapies have also shown promise for patients with a prolapsed disc. Techniques, such as acupuncture, when done in combination with other forms of pain treatment, can be extremely beneficial. Prolapsed disc is a chronic pain condition that arises due to changes in the intervertebral discs within the spine. Resulting from injury or weakness due to aging, the nucleus pulposus can bulge out through the fibrous outer layer, causing the disc to compress a nearby nerve leading to pain in the back and neck. There are a number of treatment options available for managing the symptoms associated with a prolapsed disc. Patients are encouraged to attempt conservative, at-home techniques as a first-line treatment for managing pain. However, if your symptoms persist or worsen, or if they are severe and debilitating, it is recommended that you speak with your doctor about more aggressive forms of pain management. Bogduk N. Prolapsed joint disease of the spine. Radiol Clin North Am. 2012;50(4):613-28. Jacobs WC, van Tulder M, Arts M, et al. Surgery versus conservative management of sciatica due to a lumbar herniated. Eur Spine J. 2011;20(4):513-22. Karppinen J, Shen FH, Luk KD, Andersson GB, Cheung KM, Samartzis D. Management of prolapsed disk disease and chronic low back pain. Orthop Clin North Am. 2011;42(4):513-28. Lotz JC, Haughton V, Boden SD, An HS, Kang JD, Masuda K, Freemont A, Berven S, Sengupta DK, Tanenbaum L, Maurer P, Ranganathan A, Alvai A, Marinelli NL. 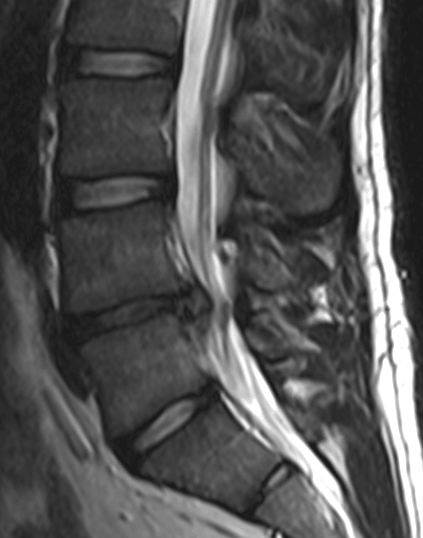 New treatments and imaging strategies in prolapsed disease of the intervertebral disks. Radiology. 2012;264(1):6-19.